The Border Terrier is a scrappy little breed that is so named because they were developed on the border between England and Scotland. The Border Terrier is believed to be one of England’s oldest terrier breeds. With their wiry short coat, high energy levels, narrow build, and solid bone structure, the Border Terrier excels in their original function of hunting vermin. Today’s Border Terriers often are seen competing in earth dog, obedience, and agility courses. Border Terriers are an intelligent and affectionate breed that also contains the ruggedness necessary to function in their original role. Originally bred as a working dog, this breed has an energetic personality that many owners love. Border Terriers take extremely well to training, as is evidenced by their use in a broad array of competitions and as therapy dogs. They should be trained and socialized from a young age, and respond best to positive reinforcement training. Border Terriers are high-energy breed that has a large amount of stamina packed into a small body. They will need daily exercise and attention to avoid any misbehavior. Long walks, play sessions, and training in one form or another are all excellent forms of exercise for this breed. Always keep your Border Terrier leashed when playing or walking unless he is in a fenced yard. Border Terriers live anywhere between 12-15 years. Border Terriers are the 86th most popular AKC registered breed. Border Terriers have a tendency to get overweight as they age, so moderate overfeeding or giving too many treats throughout the day. Look for a balanced food that contains quality ingredients and avoids any grain-based fillers. The average Border Terrier weighs between 12-15 lbs., so expect to feed them around ¾ to 1 cup of dry food a day, split into two meals. Border Terriers have a wiry outer coat and a thick undercoat, so it is necessary to keep a consistent grooming routine and brush your pup at least once a week. This breed is also known for their shedding. It is recommended to strip your pup’s coat at least twice a year to allow it to remain healthy. Are Border Terriers Good With Kids? Border Terriers are generally good with children but as with all breeds, interaction with very young children should be supervised. Some lines of Border Terriers are prone towards developing hip dysplasia, a common condition found in many dog breeds. Hip dysplasia in dogs is a condition caused by a loose fit between the femur and pelvis of the dog. This loose fit causes the cartilage that pads these two bones to wear down unevenly, resulting in painful arthritis, bone spurs, and canine lameness over time. Hip dysplasia manifests in young dogs as a laxity in the hip assembly and can be assessed during a physical examination by a veterinarian. PRA is a condition where the photoreceptor cells in the retina of the eye degenerate over time. These cells are responsible for the ability to receive and perceive light. As PRA progresses, the ability to see in low or dim light will be increasingly compromised until full loss of vision occurs. The earliest symptom of PRA is a decreased ability to distinguish objects in low light, such as at dawn or dusk or in a dimly lit room. PRA is a hereditary condition, so it is advised to inquire with your breeder prior to find out if it runs in their line prior to acquiring a puppy. Unlike most other breeds, canine seizures in Border Terrier are believed to be the result of a condition known as canine epileptoid cramping syndrome (CECS), also known as Spike’s Disease. CECS manifests differently than typical canine epilepsy. Signs of CECS include shaking and cramping, arching of the back and bending of the body, inability to stand, and severe trembling. These episodes can last anywhere from seconds to 30 minutes. The exact cause of CECS is unknown, but it is believed to be an inherited condition that predominantly affects the Border Terrier breed and occasionally appears in other breeds. Border Terriers are prone towards developing canine cataracts that develop during the juvenile or adolescent phase. Cataracts are a condition where the lens of the eye becomes opaque and cloudy. As this opacity increases over time, vision becomes more limited. Although cataracts in older dogs generally develop slowly, some juvenile cataracts can progress much more rapidly. The onset of juvenile cataracts is believed to be the result of hereditary influence, but little is known about the exact cause. Be sure to incorporate checking your Border Terriers eyes as a standard part of your weekly grooming sessions in order to catch any cataracts early. 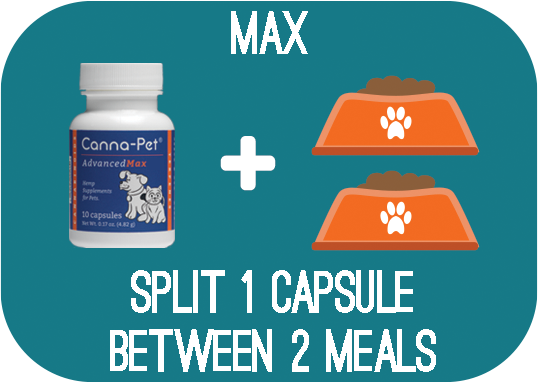 Since we have tried the Canna-Pet biscuits this last month I have seen a dramatic change in her behavior and no torn pillows, couches and furniture.